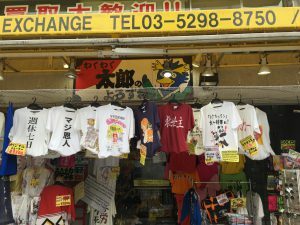 On Sunday, you can enjoy ‘Pedestrian Paradise’ in Akihabara.In Tokyo, only three ‘Pedestrian Paradise’ remain, Shinjuku, Ginza and Akihabara. Akihabara is one of representative of pop culture in Japan, you can experience atmosphere of pop culture at ‘Pedestrian Paradise’ in Akihabara. You may encounter cosplayer, find rare game, or unique souvenirs. Karma in Samurai Cosplay show you how to enjoy Akihabara. After program, you can stop by ‘Tachiomi’ (Standing Izakaya), enjoy local food and people. *Child under 15yrs. should be accompanied by parents or adult guardians. For booking, click here to Event Regist or belows. ‘Pedestrian Paradise’ in Akihabara is only on Sunday. 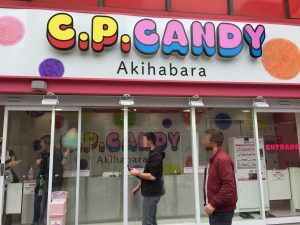 That’s why pop-cul.jp execute ‘Explore Akihabara with Samurai Cosplayer’ on Sunday. Due to regulation, there’s no food strolls, but you may meet Cosplayers. ‘Pedestrian Paradise’ is just on Chuo-dori, between Mansei-hashi and Kuramehashi-dori. Looking for costume, wig, accessories or props for cosplay? Any particular character you want to be on Halloween? If MANGA freak, how about figure or goods? Any special MANGA books you can purchase only in Japan? Maybe you need just unique souvenirs to make your families or friends smile? 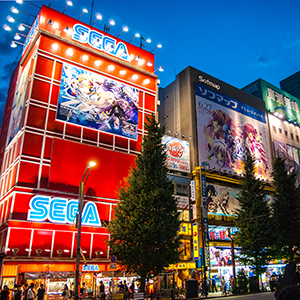 Akihabara is the place for you! Karma the Samurai also shows you some spots for cosplay, manga and souvenirs. Anything you purchase is on you. 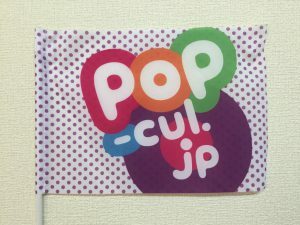 *Karma holds ‘pop-cul.jp logo flag’. No Show: No refund, 100% charge. 4 days in advance: 100% refund. Please be aware in case you book three or less days in advance the program, we apply the same cancellation policy. We may ask you to provide us evidence. We identify what evidence is required. After determination and we judge it’s fair to refund, we refund 100%. Due to very bad weather, accident, incidents or order by law enforcement, we may cancel our program. We will mail you to inform cancellation by 9:00am on program day, and we refund 100%. Entertainment Marketing, Inc., company operate pop-cul.jp send confirmation mail within 48 hrs. upon booking. We mention our emergency contact in confirmation mail. We ask yours as well. Contact us to emergency contact in confirmation mail. We prioritize participants at meeting place on time, we start the program on time. It depends how much you delay, you may be able to join the program. Since the program is conducted by one person, you should find Karma the Samurai by yourself. To your delay, we do not refund any. Without information, it’s ‘No Show’. We charge 100%.